What Is An RPZ And Why Do I Need It Tested? RPV Valve and Backflow TestingWhat Is An RPZ And Why Do I Need It Tested? RPZ stands for Reduced Pressure Zone. This device is installed onto your plumbing system to protect your drinking water and the city water supply from contaminants. 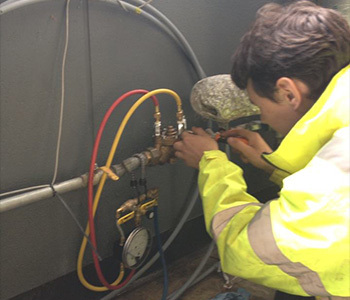 RPZ valves are required when a house or building is equipped with an irrigation system. Contaminants can enter an irrigation system from fertilizer or pesticides that are sprayed onto lawns. If there is a water leak in the house, house water service break, city water main break, hydrant flushing, or hydrant use due to a fire, the water pressure in the house or city water mains can drop lower than the water pressure in the system. This can cause water from the system to back-up into the drinking water supply. The next time you or a neighbor turns on a faucet for a drink of water, the water received could contain contaminants. Even small fluctuations in city water mains that occur due to uneven water use from one neighborhood to the next can cause drops in pressure large enough to cause a back-flow and therefore contamination to occur. If a drop in city or building water pressure occurs, the RPZ valve will open up, dumping water out rather than allowing the potentially contaminated water to back-flow into the water supply. For these reasons, Illinois State Law requires the use of an RPZ as outlined in the Illinois State Plumbing code and Illinois Environmental Protection Agency. All city governments must comply with these laws. The law not only requires the use of an RPZ device but that device must be tested once every year. Only a licensed plumber with a Cross Connection Certification License can test and certify the proper operation of an RPZ valve. Once the RPZ is tested, the certification paperwork will be forwarded to the city or village. 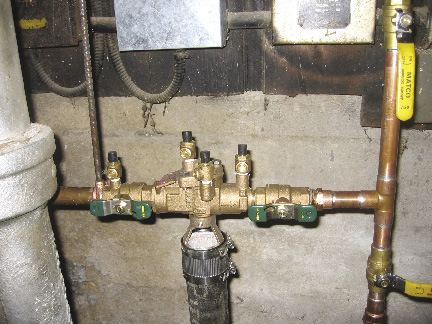 Your RPZ valve must be installed and the water must be turned on from inside the house in order to test the valve. Remember RPZ Testing is the law! The testing protects you, your family, your neighbors and your wallet. The state and villages can fine you for not having yours properly tested per the state regulations. It's the right thing to do and we're here to help get it done correctly. Call us today for more information.